We are getting ready for St. Patrick's Day at our house. Nothing big, but we always do a little something. Sometimes we get bored on Sundays so we take an old favorite recipe and change it up a bit. These cookies were the result of a fun Sunday afternoon spent baking in the kitchen with all of my kids. The kitchen is our favorite place for family time. Mix butter, sugar, eggs, vanilla, and almond extract in a bowl. Mix till well blended. Then stir in flour, baking powder and salt. *Chill dough in refrigerator for 1 hour. Roll out dough on lightly floured surface and cut with cookie cutters. Bake on greased cookie sheet at 400 degrees for 6-8 minutes. *This is my very favorite sugar cookie recipe. 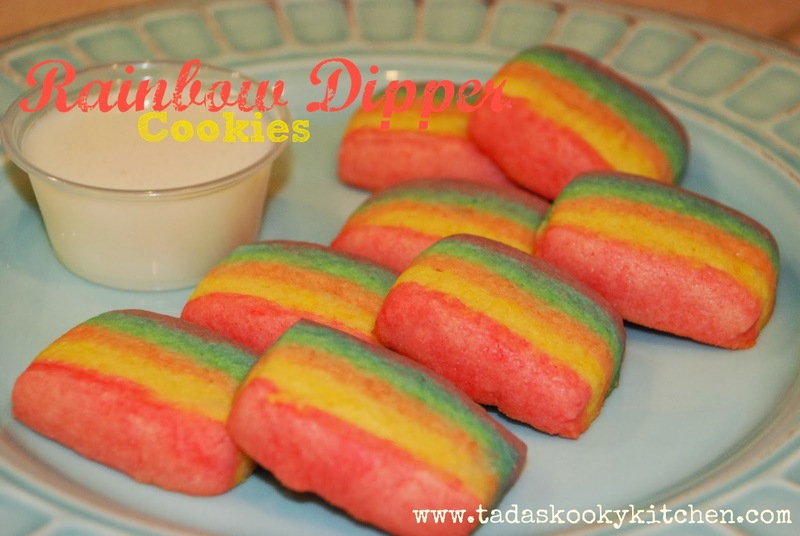 To make the rainbow dippers follow instructions for cookies above. Then divide the dough evenly into 6 bowls. Using food coloring, make all the colors of the rainbow Red, Orange, Yellow, Green, Blue, and Purple (or Violet). Then cover each bowl and chill in fridge for 1 hour. Next on a clean flat surface roll out your first color (red). That will be your base layer, then using a sheet of wax paper, roll out the next color on the wax paper till it is about the same shape and thickness as your first layer. Then turn that over onto your red dough. Do this for each color, continue rolling out each color of dough onto the wax paper and transferring to your "stack" of dough. You should end up with a stack of colored dough about 1 1/2 inches thick. Next using a long knife, starting on one end of your stack of dough, cut a strip about 1/2 inch thick from your stack of dough. Then lay the trip on its side and cut it into 2 inch segments. Lay these segments on your prepared cookie sheet and bake as directed. Dip your cookies in the cookie glaze and enjoy! Mix powdered sugar, vanilla, and 1 TBSP milk add a little more milk if necessary till it reaches a drizzling consistency. Welcome to Tada's Kooky Kitchen. 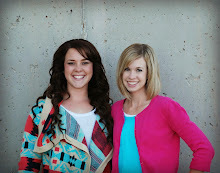 We are Tabitha and Donna. We grew up in a family with ten kids and a mom who cooked everything from scratch. Here at Tada's you will find food, family, and fun. Hope you all enjoy! How to: Clean Microfiber Couches AND get the water spots out too! !